Marmite… Sprouts… Donald Trump… what do all three have in common? They’re either loved or hated – there’s rarely a middle ground! And that’s exactly what Net Entertainment’s latest Video Slot, Neon Staxx has done to the online casino world. Some players love it – while others avoid it like the plague – and while it’s… “different” … it is actually a pretty exciting game, once you get the hang of it. 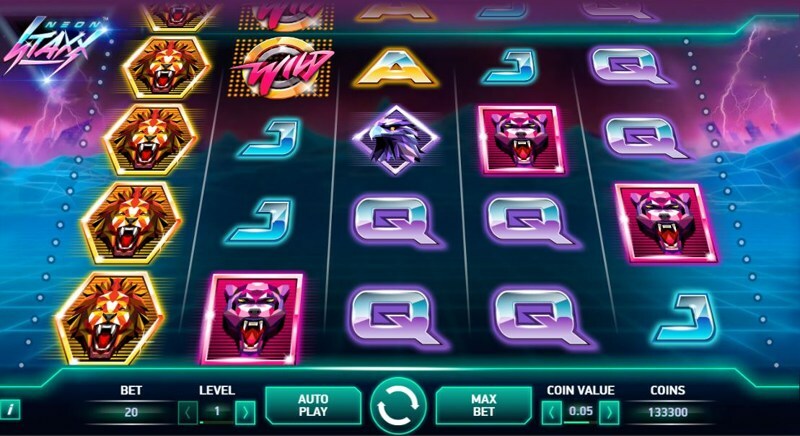 Based around a late 80’s/early 90’s retro theme, the game combines elements of science-fiction with neon lights, and vibrant sounds, and this 5-reel slot uses a unique 4-rows to deliver a rare gaming layout. There are 40 pay lines in total, and these are fixed, meaning you can’t change the number you play. The game’s background features a Tron-looking landscape, and you’ll see lightning strikes hitting buildings in the distance, setting a strange, almost eerie theme. The reels look – well; strange – and on them, you’ll see a combination of the low-paying the lower-paying playing card symbols, including 10, Jack, Queen, King, and Ace, as well as the high-paying symbols, which are various Predators. These include Lions, Panthers, Eagles, and Snakes. You’ll also see a pink Wild Symbol, which can land on all five reels. 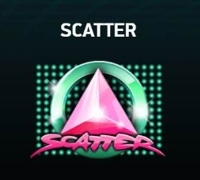 The scatter symbols in Neon Staxx is represented by a Pink triangle, on a green, circular backdrop. As soon as you press spin, one symbol is randomly selected to form part of what’s known as the “Superstaxx” set, which is essentially a collection of stacked symbols. Similar in function to Net Entertainment’s Motorhead, these symbols can cover the entire game board… a small portion of it… or no positions at all… and if you manage to get the first 4 reels landing the Superstaxx, you’re in for ludicrous 4-of-a-kind wins. Imagine what landing all five would do for your balance. (The scatter symbol is the only symbol that can’t be selected as the Superstaxx symbol – but the wild can, and this offers a massive chance to win substantial amounts of money. 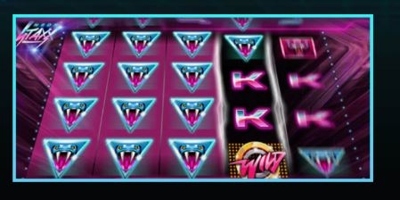 Once the free-spins round begins, the Superstaxx bonus continues to play on each and every spin, but what’s super-cool about the bonus, is that the low-paying symbols – the traditional playing card symbols, including 10, J (Jack), Q (Queen), K (King), and A (Ace) – are excluded from the Superstaxx, meaning only the high-paying predator symbols form the Superstaxx. While there’s no multiplier action… and while you can’t re-trigger the free-spins… it’s a great feature if you can land the high-paying symbols on even three reels, and Neon Staxx offers a fantastic array of opportunities for players to score big wins.